A MAN WITH 17 different aliases has been acquitted by a jury of attacking a prison officer with his meal tray and severing a tendon in his wrist. 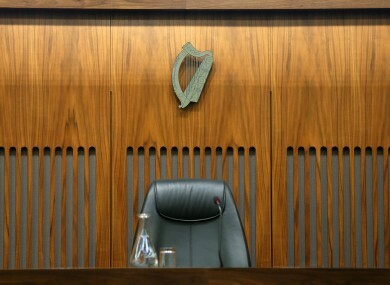 Ceraldo Eyken (45) was found not guilty at Dublin Circuit Criminal Court of assault causing harm to prison officer Gareth Sheeran at Cloverhill Prison on April 11, 2009. The jury took just under an hour to return its verdict to Judge Sarah Berkeley, following a two-day trial. Mr Eyken, of Chaplin Court, Clondalkin, Dublin, had been in custody over the alleged use of false identities. Elva Duffy BL, prosecuting, told the court in the absence of the jury that Mr Eyken had 17 different aliases and that gardaí could not confirm which was his true name. Mr Eyken denied the assault charge and told gardaí he had been defending himself from a fellow prisoner who had pushed him down the stairs seconds earlier. The incident took place just before tea-time in the prison, as inmates came downstairs to the serving area carrying their empty trays. Mr Sheeran, who now works as a prison officer at the Dóchas Centre, told the court he spotted Mr Eyken lying on the ground at the foot of the stairs and went over to diffuse a potential argument. He said he got “caught in the middle” of two inmates and put his arms up to block a meal tray which was brought down forcibly upon him. Three tendons in Mr Sheeran’s wrist were torn and one was completely severed. He received 19 stitches and had to undergo plastic surgery. Mr Sheeran suffered permanent nerve damage and has been left with a constant tingling sensation in his wrist. The meal tray, with one end shattered into sharp fragments, was presented to the jury as evidence. The jury was also shown CCTV footage of the aftermath of the incident, where Mr Sheeran could be seen running and holding his left wrist. Seamus Clarke BL, defending, pointed out that the footage also showed several prison officers gathering around another inmate and escorting him away. “This is a case of Hamlet without the prince,” said Mr Clarke, claiming the absent villain was the other inmate who had pushed Mr Eyken down the stairs. This inmate was seen with his fist clenched by another prison officer, while a third officer saw the inmate standing over Mr Eyken as he lay on the ground. Mr Eyken told gardaí of an incident earlier that day when this other prisoner had allegedly stopped him from using the weights machine in the gym. Mr Eyken reported the matter to officers and said the inmate later threatened him and called him racist names. As he walked downstairs for his tea, Mr Eyken said he felt someone lifting him from behind causing him to fall down five or six stairs and hurt his kneecap. He said he was in shock and angry as he thought he was going to die. He said he “lost his senses” and went to defend himself with his tray, which the other prisoner broke. Mr Eyken said he did not see Mr Sheeran coming to separate them, and said he was very sorry that the prison officer had accidentally hurt his hand on the broken tray. Email “Man with 17 aliases acquitted of attack that severed officer's tendons”. Feedback on “Man with 17 aliases acquitted of attack that severed officer's tendons”.